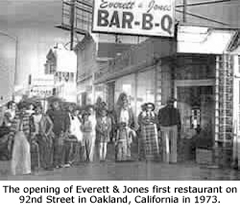 Everett & Jones Barbeque was started by Dorothy Everett with her eight daughters, one son and one son-in-law (Jones) in Oakland, California in 1973. Dorothy and her husband Cleveland were born and came of age in rural Alabama, in a small town named Westpoint. With three children and another on the way, the family decided to seek new opportunity in California. 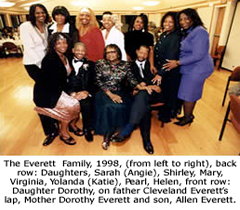 In 1952, Cleveland Everett departed Alabama first to find work and a place for the family to live and Dorothy followed later with the children. Eight years later Dorothy and Cleveland separated leaving Dorothy to care for the children. She worked hard to support her children as a domestic and held a part time job tending a smoke pit for what was to become Flint's Barbeque. Deciding to strike out on her own, she borrowed seven hundred dollars from her good friend Cora, "the Angel". With a week's line of credit from her suppliers she opened her own barbeque restaurant heavily dependent upon the Lord. An old building on the corner of 92nd Avenue in Oakland, California, in need of much work was rented. The whole family pitched in to get it going. 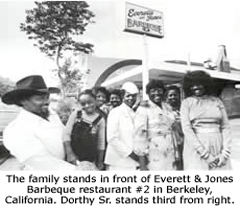 Annie Everett-Jones was the only daughter married at the time, so the family named the new restaurant Everett & Jones Barbeque. The business began as a family enterprise and continues that way today. With little money for advertising, the family depended on word of mouth to bring in customers. Family members fanned out in the neighborhood passing out fliers and giving free samples to local bars and business establishments. Slowly the business grew. the long hours and low pay (sometimes no pay) began to pay off. In 1974 the family opened their second restaurant on the corner of University and San Pablo Avenues in Berkeley, California. A third was opened in 1975. While celebrating the third anniversary of their first restaurant, tragedy struck. The unattended wood burning pit caught on fire and burned the restaurant beyond repair. Standing in front of the burning building, still in their party dresses, family members hugged each other and cried. A year later in 1977 the family opened a new restaurant one block away from the original location. The business has continued to grow to include six locations in Hayward, Oakland and Berkeley in the San Francisco Bay Area. From the beginning, the family business has received the kind of critical acclaim that a press agent would kill for. A 1979 cover story on barbeque in New West magazine, called Everett & Jones the barbeque against which all others anywhere must be judged. Of the sauce, author Charlie Haas wrote, " . . . defies the odds against such things with a successful mixture of heady fruit-sweetness and peppery clout"
Greg Johnson and Vince Staten, in their valuable 1988 guide to the nation's best barbeque joints and sauces, titled Real Barbecue, declare that Everett and Jones sauce is the best in medium and hot varieties. they write, "The sauce is very sweet, almost fruity and very smoky, with a persistent perspiration factor that builds with each bite. The business continues to grow. The strategy for growth combines professionalizing its business operations while moving into retail food product distribution and expanding the geographical location of its restaurant units. "Today, many of Dorothy's children are at the helm of the business, and a number of her grandchildren are moving into positions of leadership to see the business into the future. Dorothy Everett's vision and hard work have given her the means to provide for her family. She says, "I thought that I would never earn more than $3.00 an hour. With nine children, I always believed that God would make a way for us. I had a dream. I wanted to build something that my children could fall back on. He answered my prayers."